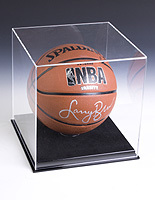 You got your favortie quarterback's signature on a football, so the next step is to get it under cover! 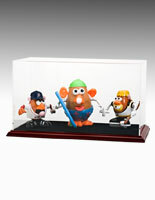 These sports display cases support balls and memorabilia from all teams in a very affordable way. 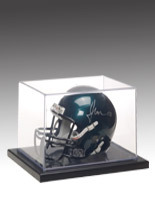 Some autographed items can be worth a lot of money, therefore the last thing any collector would want is to leave the ball or helmet exposed to dust and dirt. 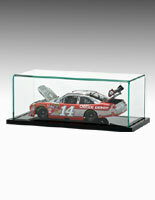 The sports display cases are simple to use with only two specific parts: the cover and the base. 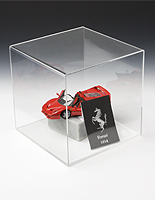 We only use clear acrylic construction for the covers that's either injection-molded or glued from individual pieces. 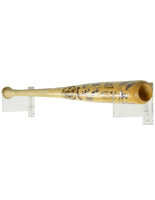 Bases are available in black plastic or upscale stained wood finishes. 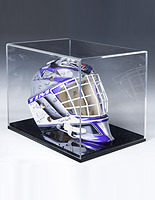 These sports display cases are designed for balls and helmets. 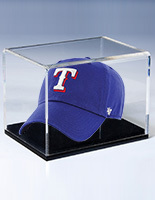 Will a cover protect a collectible carnival glass bowl? Of course it will, but the point we are trying to make is some of these displays are meant for very specific applications. For example take our football dust cover. 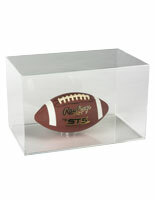 The clear acrylic cover features an octagonal design that mimics the shape of a football beautifully. 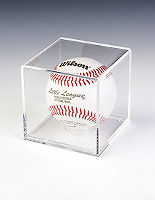 Or take the small 4" acrylic cube that's perfectly sized for one baseball, or the wall rack that can hold up to 12 baseballs. 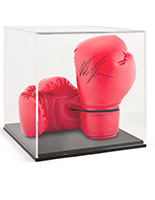 It's applications like these that are sought after by sports memorabilia collectors. 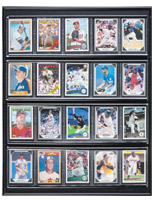 What are some more features of these memorabilia holders? 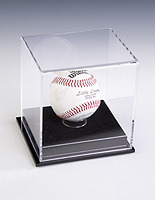 Sports display cases with dome lids can store autographed game balls, football, a baseball bat, or miniature football helmets. 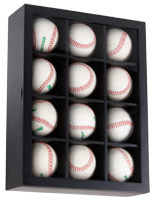 Shadow boxes for wall hanging with plastic slots are great for baseball cards; other flat displays store an entire collection of game balls. 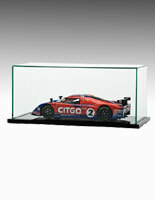 Museum fixtures highlight diecast models of trains, planes, cars, and action heroes, singly, or in select thematic groupings. 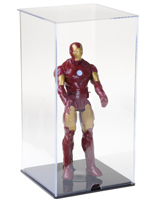 Protective enclosures are the perfect way to keep antiques from yellowing or collecting dust, such as dolls and fragile objects of art. 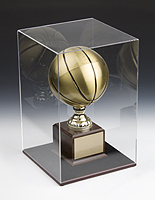 The savviest retailer, museum curator, or upscale antique dealer values quality and budget savings side by side. 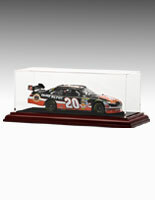 With that thought in mind, these inexpensive display cases with lift-off domes come in varied grades of plastic, widths, and thicknesses; from super-protective acrylic, to less expensive lightweight injection-moded polystyrene, to green-edge acrylic for a polished look similar to glass; to plexiglass, the highest grade compound of plastic that most closely resembles glass, costs are reflective of each. 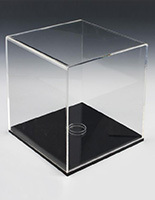 Since lid-type enclosures are not secured to the base, they are meant to protect items only from dust and handling and to deter handling. 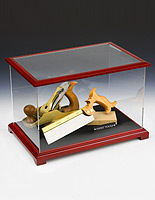 Find locking curio cabinetry for on our website-at-large, along with jersey frame holders and other styles of protective showcases for a more secure presentation. Now that you’ve thought about dome construction, it’s time to look at base quality and style. Again, with an eye on price point, select materials accordingly; museum-quality materials such as rubber wood, mahogany, and black Paulownia make a stunning statement for expensive items. 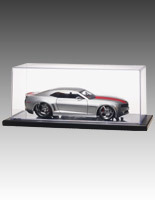 More affordable alternatives include frameless stands made of acrylic or plexiglass, and showcases with MDF laminate bases that make objects pop in black or silver. 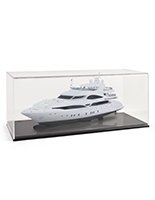 Try a mirrored base for smaller, more delicate items; take advantage of removable platform risers that hold both round and flat objects.